After a long day of wearing makeup, having my face sweat during the hot, humid summers in Philadelphia or even dealing with all the pollution in the air – nothing makes me more excited than washing my face as soon as I get home. Having my face feel squeaky clean is honestly the best feeling and I’m extremely adamant about washing my face in the morning and evening every day. No exceptions! However, day after day when I would apply my makeup, I never felt as if it laid smooth on my face and sometimes it would even feel “cakey.” Not because of the product (as I have tried many types, and they all left me feeling the same way) but the smoothness was never there. And after some time my face would feel dirty. During my eyelash extension refill appointment, I brought this up with my esthetician Nikki to see if she had any suggestions. As we were discussing, she asked if I ever heard and or wanted to try dermaplaning? Uh…derma-what? First, if you aren’t familiar with dermaplaning, here is a quick definition: it’s a method only a professional esthetician performs on your face to scrape off the top layer of your skin. This process helps remove unwanted dead skin cells (along with any peach fuzz) leaving your face feeling smooth while giving you a brighter, natural complexion. Did I just hear scrape? WHAT? Don’t get me wrong, when she was informing/describing this method to me I myself was a little petrified at first. But after we went over everything in great detail, I felt confident dermaplaning was something right up my alley. Before we got started, Nikki explained the technique for dermaplaning, which truly is painless. She showed me the specialized surgical instrument (with a disposable blade) that she would be using. This instrument is only used explicitly for dermaplaning. After prepping the room, we were ready to get started. Ladies, as soon as I was all done, I was in awe of how incredible my face looked and felt. It honestly felt like a baby’s bottom: super smooth! My skin appeared to be brighter, and I was glowing. The entire process was painless, and I didn’t mind the scraping at all. I kept thinking that the more she scrapes, the better. When you thought your face was really clean! The first two days after my treatment, my skin was a little scabby. But that’s a good sign! This means the technique of removing all unwanted dead skin and any problem areas under that layer of skin worked. Day three after my treatment, the scabs, and any unwanted blemishes cleared up. It’s been a couple of weeks since my treatment, and I’m still in love. I will catch myself looking in a mirror admiring my really bright, smooth skin. Applying makeup is so much easier, and I use fewer amounts of product because of the evenness of my skin. After I clean my face, it truly feels so much cleaner. It makes me wonder if my face was even clean before dermaplaning. I cannot wait for my next scheduled appointment. Below are the answers to your questions and if you think of others, feel free to share below or send me a message, and I will get them answered for you. Personally, I didn’t feel any pain at all. This method is supposed to be painless. From start to finish, less than 45 minutes. If hair is being removed during dermaplaning, does your facial hair grow back thicker and darker? No, because this technique is different than shaving your face, your hair grows back naturally how it was before. I was informed the peach fuzz will grow back slowly (usually 4-6 weeks). Think of dermaplaning the same way as if you were to tweeze your eyebrows. Everyone is different, but on average you can schedule appointments a month to a month in half between each one. Are there any side effects or any downtime after dermaplaning? No downtime is necessary. Since it was my first time, I felt as if my skin felt a bit scabby, but after two days it was so smooth. I couldn’t believe it. Since your face is back to its pure state, be sure to wear sunscreen (as you should every day) because your face is more sensitive to sun exposure after treatment. Pricing varies, but you are looking at $135 to $200 per treatment. 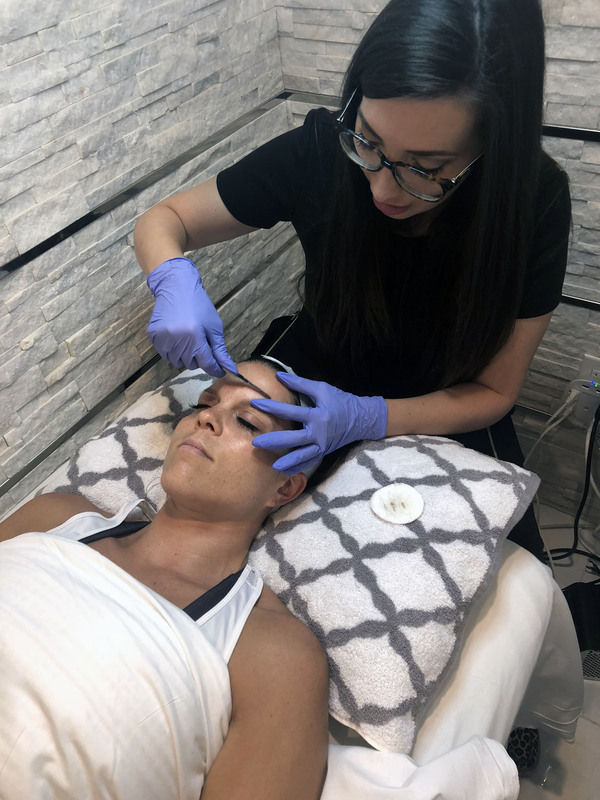 If you are in the Greater Philadelphia Area and want a dermaplaning session – schedule an appointment today with Nikki from Forever Young Med Spa. Have you tried dermaplaning? Please share your experience below! Feel free to follow Forever Young Med Spa on Facebook and Instagram for other services.